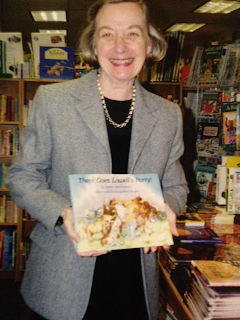 Teaching Authors--6 Children's Authors Who Also Teach Writing: Pat Wroclawski: A Bookseller Extraordinaire to the 4th Power! Pat Wroclawski: A Bookseller Extraordinaire to the 4th Power! What better way to continue celebrating our 4 x 4 Blogiversary Celebration by introducing our readers to the incomparable Pat Wroclawski, Bookseller Extraordinaire to the 4th Power. Sadly, Pat left the world way too soon in March of 2005 but her Spirit lives on in the countless individuals she touched – readers, writers, parents, teachers, me. Everything I’d heard about Pat proved true and then some. Her never-ending knowledge of children’s literature. Her impeccable taste in books. Her respect for and interest in writers and illustrators. Pat’s passion for All Things Children's Book glowed from within. The Bookstall’s Children’s Book Section became an invaluable resource for me as I traveled my Writer’s Plotline. The best of the best lined the section’s shelves. Of course Pat herself proved the best resource of all. She cheered me on as I made my way, introducing me to esteemed authors and illustrators, to books I should know, to opportunities that helped me grow as a writer, and to the Association of Booksellers for Children, which Pat helped found, now a part of ABA re-named the ABC Children’s Group and a most vital piece of the Children’s Book World. I shall always remain grateful for how warmly Pat welcomed and embraced my fellow SCBWI-Illinois members. Pat oversaw my very first Book Signing for my very first book, There Goes Lowell’s Party! She personally decorated the store’s windows and greeted each and every guest. Seeing Pat’s smile undid my buckling knees. As well as mentor, teacher, advocate, friend. For years Pat wrote the organization’s monthly column “At Home with Books.” In the Fall, 2005 issue, her daughter Margaret Wroclawski Griffen shared with readers what her mother taught her about children’s books. Titled “Everything I Know About Children’s Books I Learned From My Mother,” this beautiful tribute keeps Pat’s Spirit alive. The Margaret Wroclawski Memorial Collection now holds some 100 titles at the Winnetka/Northfield Public Library. Like the books they hand their readers, booksellers change lives too. Especially extraordinary ones, like my Pat Wroclawski. 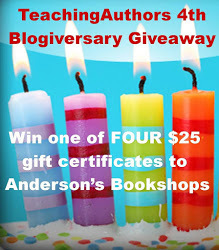 Don’t forget to celebrate our 4th Blogiversary by entering our 4 x4 give-away! You can win one of 4 $25 gift certificates to Anderson’s Bookshop! All you need do is share the name of your favorite independent bookstore, and maybe even bookseller. What a wonderful tribute to an extraordinary woman, Esther. I'll tell you one thing: I want YOU writing my obit!